A lot of us remember the responsibility of paying off student loans and how happy we were when that debt was cleared. We were raised with the expectation that education is the key to our futures. But along with that key comes the loans — loans that have ballooned in the years since I was in school. 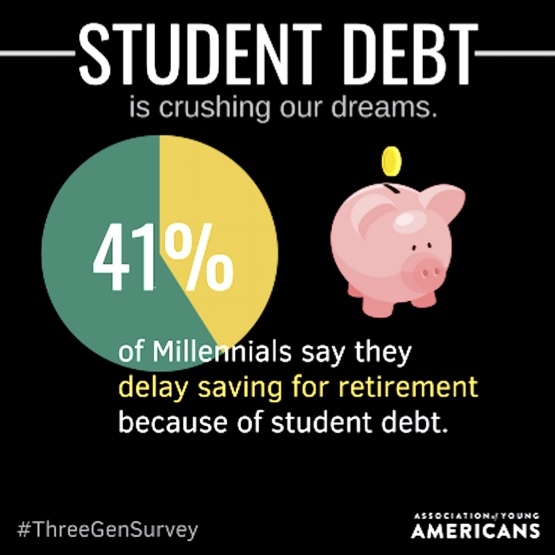 New research from the Association of Young Americans and AARP shows that student loan debt is preventing Americans across three generations from saving for retirement or buying a home. As many students begin their academic year, nearly half of those with student loan debt say they owe more than $30,000. According to the Federal Reserve Bank of New York, borrowers have more than $1.4 trillion in student loan debt. The new research specifically shows that of those who have student debt, 45 percent of Millennials, 48 percent of Generation Xers and 50 percent of Baby Boomers owe $30,000 or more. The survey highlights how three generations view major issues facing the nation. Saving for Retirement — 4 in 10 (40 percent) say student loan debts have stopped him/her from saving for retirement, including 41 percent of Millennials, 38 percent of Gen Xers and 31 percent of Boomers. Buying a Home — 1 in 3 (32 percent) say student loan debt has prevented or delayed him/her from buying a home, including 36 percent of Millennials, 26 percent of Gen Xers and 32 percent of Boomers. Helping a Family Member — 1 in 4 (25 percent) say student loan debt prevented or delayed him/her from financially helping a family member, including 23 percent of Millennials, 29 percent of Gen Xers and 26 percent of Boomers. Getting Health Care — Nearly 1 in 5 (16 percent) said student loan debt prevented or delayed him/her from getting needed health care, including 17 percent of Millennials, 16 percent of Gen Xers and 9 percent of Boomers. Six in 10 Americans don’t view the benefits of college as worth the cost. Across generations, the views about college not being worth the cost held steady with 61 percent of Millennials, 62 percent of Gen Xers and 53 percent of Boomers sharing the same view. 3 in 4 (74 percent) agree strongly or somewhat that community colleges should be free for anyone who qualifies. 6 in 10 (66 percent) agree strongly or somewhat that colleges and universities should share the financial responsibility with students who default on their loans. 8 in 10 (86 percent) agree strongly or somewhat that state and federal government should invest in career and technical education programs as alternatives to college. 8 in 10 (79 percent) believe strongly or somewhat that state governments should increase support for public universities so more people can afford college tuition. 7 in 10 (76 percent) strongly or somewhat believe that the federal government should help people refinance student loan debt. 6 in 10 strongly or somewhat agree that the federal government should forgive some student loan debt (61 percent), help people repay some student loan debt (58 percent) and tax stock market transactions to subsidize tuition at public colleges and universities (60 percent). These survey results don’t necessarily reflect the policy positions of AYA or AARP.